For me, Thanksgiving is usually about letting go. I try not to be annoying. I do my best to stay out of the way of whoever is in the kitchen. I try to keep my mouth shut when the electric mixer comes out to whip the potatoes (one year I brought my potato ricer with me, and I haven’t done that since) and canned green beans are taken out of the pantry for the casserole. I help if I’m asked t0 and I offer my services as a dishwasher. It’s just that while I always want to try new things—maybe give that menu from Bon Apetit a shot and do it to a T, or perhaps make cornbread stuffing, rather than the kind we always make, eh, eh?—in my family it’s all about doing things the same as we’ve always done them. My grandpa makes a very, very good stuffing, and my grandmother’s recipe for candied yams—boiled yams, sauteed in an electric skillet in butter and brown sugar and a few pinches of salt (to which I secretly add a few grinds of black pepper, which is unorthodox)—is, indeed, something to look forward to all year long. And holidays are about traditions, and the repetition of familiar things is just what traditions are. 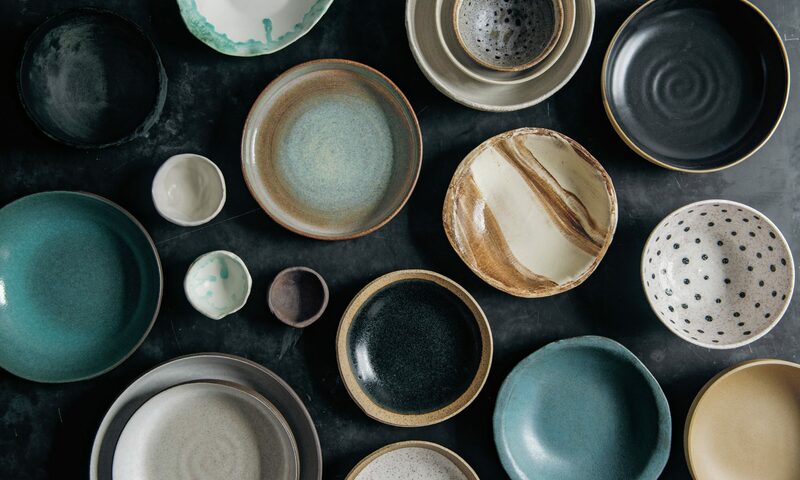 What’s my problem with having one holiday, one day a year, when you can roll up your sleeves and put your muscles through the those familiar motions, savor those familiar smells and familiar tastes, and enjoy the familiar company in the kitchen? Here I pound my fist on my desk: But doesn’t it start to get old, even if it’s just once a year? I think it does! Can’t a holiday can be made more special by giving something new a shot? I’ve harbored a lot of Thanksgiving fantasies over the years: mostly it consists of hosting Thanksgiving at my house, choosing the menu, doing the shopping, and being in the kitchen all by myself for those few days leading up to the holiday. I just don’t want to have to negotiate, which is a problem when it comes to family holidays and a big reason, probably, why I have yet to realize the outlines of this particular Thanksgiving fantasy. (I’m sure I sound like a lot of fun.) But one of my favorite Thanksgivings, because, I think, there was such a sense of spontaneity and freedom about it, was the one right after I moved to New York. My Idaho friends who were in college upstate came into Brooklyn to stay with my roommate Dave and me. We planned a whole meal—I made focaccia, salad, and vegetarian lasagna for our vegetarian contingent, and Dave roasted a turkey and made oyster stuffing. I think I made a chocolate mousse cake, using the recipe from the restaurant where I was working at the time, and it may not have mattered that there wasn’t pie. (Was there pie?) Honestly, I don’t remember much about the food, except that we ate it and we enjoyed it, sitting cross-legged on the sloped hard-wood floors. And maybe I’m coming full circle here, because in this example food wasn’t what was memorable. It was the company and the good energy, made even a little bit better by the booze. See, I just need to let go. But getting to the point, if you’re foregoing the turkey and gravy, you’re already doing things a little different. 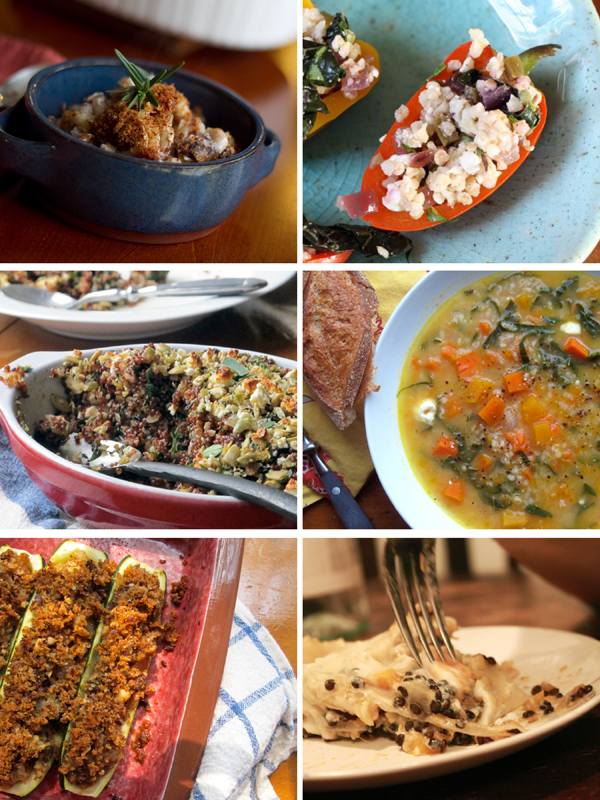 I thought I’d highlight here a few vegetarian dishes that might grace my fantasy Thanksgiving table. Mushroom Macaroni and Cheese: This is one of my favorites from Vegetarian Entrees that Won’t Leave You Hungry, recently featured over at Good Veg. Bulgur Salad Stuffed Peppers: Dana, of the lovely baking and veggie blog Dana Treat as well as my favorite bookstore in Seattle, The Book Larder, recently wrote about her take on my Bulgur Salad Stuffed Peppers (also from Vegetarian Entrees that Won’t Leave You Hungry). That photo in the top right is hers. Quinoa Bake with Pumpkin Seed Topping: I had this hearty, rich, centerpiece dish on the blog not long ago, and it would work very nicely as either a side or as a veggie main. There’s a lot of flavor here, and hey, it’s a healthy one, too. Bulgur Chowder with Butternut Squash, Kale, and Feta: Soup may be a stretch for the Thanksgiving table, but this one, if you can sneak it in, will lend some lovely color and tangy richness, and just might become a permanent player. Zucchini Stuffed with Eggplant and Hazelnuts: These could function as a side for the omnivores, or as a light-ish main for the veggies. Hazelnuts always make me think of the holidays. Lentil and Squash Lasagna with Caramelized Onions: Not the lasagna I made in the Thanksgiving mentioned above, but this lasagna is a Thanksgiving-worthy effort. You’ll dirty some dishes. Flavor and richness-wise, it falls squarely into the Thanksgiving oeuvre. And now here’s the the last thing I feel about Thanksgiving: I always end up wishing there was something light on the table. Not everything has to be. I’m fully behind food decadence around the holidays, especially since it only happens a couple times a year. But at some point all that richness begins to wear me down. In my family, several years ago, we added a vinaigrette-based greens salad to the table, tucked in behind the buttery rolls, candied yams, stuffing, gravy, turkey, all that. This shouldn’t have been such a revelation, but it was. And in that vein, I’m offering today something light that, come next Thursday, will either revive your interest in seconds or thirds, or will give you some sense of reason and reassurance after you’ve finished eating. In my CSA a few weeks ago I got a few pounds of quinces, and I wasn’t sure what to do with them. 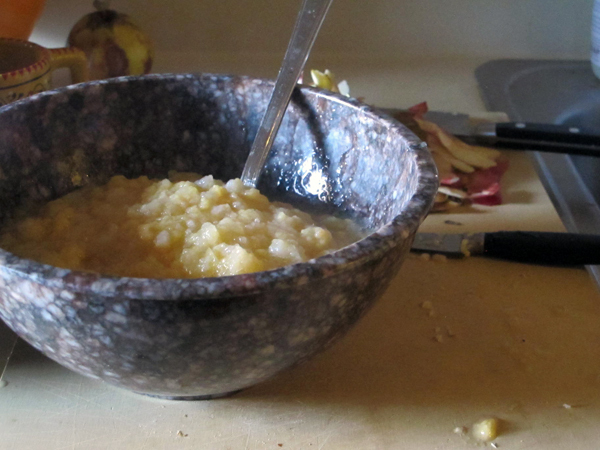 In such instances I turn to Vegetarian Cooking for Everyone, which prompted the Apple-Pear-Quince Sauce below. Quince is an ancient fruit, perhaps best known in the form of membrillo, that quince paste that shows up on cheese plates. I think of the uncooked fruit as something of a cross between an apple, a pear, and dare I say it, a potato (at least texture wise). This sauce is a clean expression of the fruit. 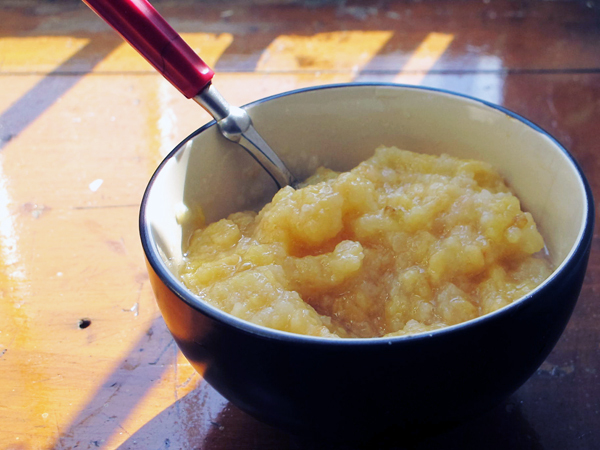 It’s easy, it keeps well, it’s an unexpected take on applesauce, and it will be ever the antidote to all the other rich food you may or may not be eating. And if you don’t have it at Thanksgiving, it’s excellent stirred into your morning oatmeal. You can adjust the ratio of quince, apples, and pears as you’d like, as long as there’s 3 pounds of fruit total. 1. Peel and core the quinces, apples, and pears. Slice the quince into 1/4-inch thick wedges, the apples into quarters, and the pears into eighths. This is the best way I’ve found to get everything cooked in the same amount of time. (If you have a food mill, you don’t need to peel and core, just slice.) As you finish cutting up the fruit, toss it into a heavy pot along with the lemon juice and water. 3. You can mash the sauce up with a potato masher to achieve a rustic, lumpy texture. For a smoother texture, use an immersion blender or pass the sauce through the smallest setting of a food mill, which will also filter out the peels and seeds. Add spices, if using, and tweak the flavor with lemon juice, honey, or sugar if too sweet or not sweet enough. Allow to cool, then refrigerate until ready to serve. That sauce looks so good, as do the rest of the recipes! I’m getting together what I’m making for the holiday soon, so this was posted just in time, thanks! Thanks! I was worried everyone will have already figured out their menus by now, so that’s good to hear! This is my first Thanksgiving as a full-fledged vegetarian, and while I’m not much of a cook yet, your recipes are definitely inspiring me–thanks so much! Glad to hear, & good luck! I just made this sauce – fantastic! I loved it stirred into some oatmeal…absolutely dreamy 🙂 Thanks so much for posting! 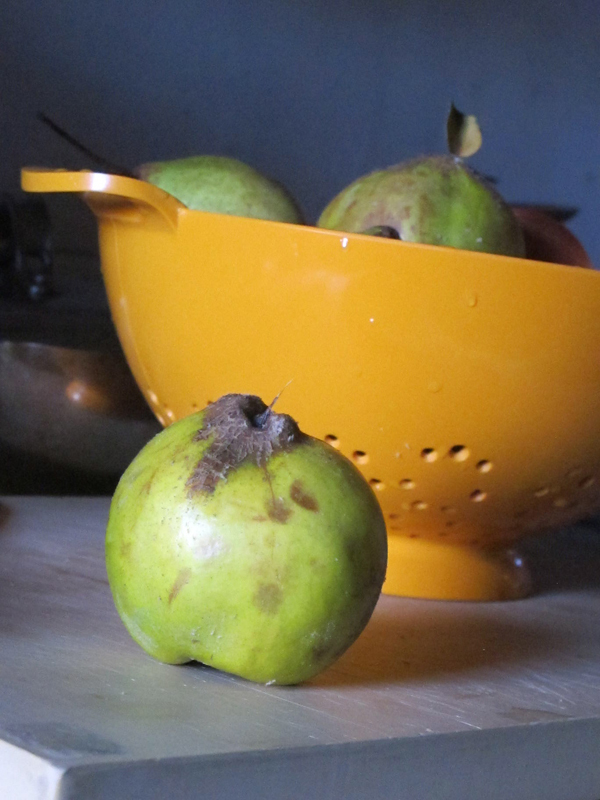 Thank you for this recipe; we love quince and I plan to use this to dress up a Honey Cake for Rosh Hashanah. Sounds wonderful – you’re very welcome!